I had insisted we visit her house on our way back. Shree also agreed. He and I both had liked the food they gave us when we took a first break after entering Zanskar. I remember I laid myself on the ground soon as we got down from the Scorpio, in the comforting late morning Sun. 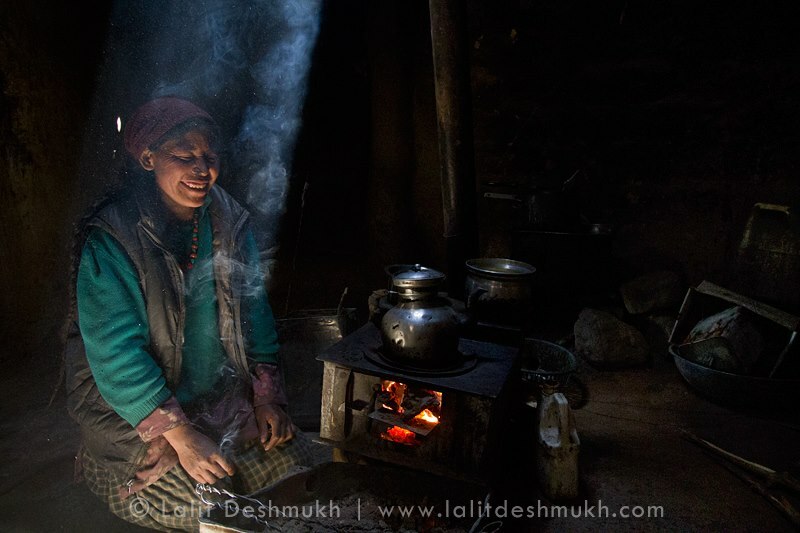 Next moment Shree had woken me up as a young beautiful zanskari girl brought two colorful flasks filled with tea, one a regular milk tea and the other Ladakhi gurgur tea. She also brought a basket filled with otis and with it some vegetable dish prepared. We did not know what that was, Half awake I started eating it, and instantly had realized how hungry I was and how wonderful the food tasted like. Another lady walked across the street to us in the small farm we were eating with one more flask. An old man stops and sits besides us on the ground bending his knees up. Apparently he needed the lift that our driver had agreed to and all this had happened in the Ladakhi language they spoke. Lady, very shy as well gives the flask to Stanzin our driver, and he pours one cup fro Shree and the other tourist an army soldier with us. Cha they called it, a local beer prepared from the wheat. I preferred my gurgur tea. The taste of that food and tea was still with us after spending 8 days in Zanskar. During the trip to Fuktal Stanzin had told us the story of that family, when we cracked joke about his special interest bout the girl . Stanzin usually joking , had gone silent and serious and told about the song that girl composed and sang, one he recorded on his mobile he said. It was heartbreaking when I listened to that song he said.. I cried a lot. She told about her sad story about losing her father and how hard its for her to live and how none cares about her. We felt a bit ashamed. I had thought we could stop at their place on our way back and help them out. Very quickly we were ourselves again. On our return journey we stopped by this house again. This time in the early afternoon. the town was pretty sleepy or it felt as sleepy as most people had gone to work in the fields, including that girl as Shree asked about her. I knew his kind heart called for her to help her out monetarily. After visiting a couple of houses by Stanzin and his brother the mother came smiling and briskly went up the house to make the tea for us. Stanzin’s brother who we met as he was returning home from Jammu with a new tractor, talked to her on the way to us and called us in. Shree went upstairs, I had decided to stay on the driver’s seat still, brought vehicle to the side and stepped out. I followed Shree and as he climbed up the ladder to the upper floor. These zanskari houses have the front door which first leads to the den for the yaks and sheep and then a ladder to go up. I entered and first I felt the staunchly smell of the ammonia from the urine of the animals, who had gone out for feeding. The next thing I heard is the call from Shree, a loud one to come up quick. Instantly I knew what it was all about. We were so assimilated into the zanskari culture I ran back to the vehicle and brought my camera and walked upstairs hurriedly setting up higher ISO numbers and working on the aperture and shutter speeds. and there this was as expected exactly. This lady was sitting by the fire, in this dark room and the heavenly light from the roof falling on her, as the smoke taking the light stream to travel up and outside. Here the shy zanskarpa lady smiles with her eyes closed, represents the soft nature and the beautiful culture. One of the very divine moment of my month long trip to Ladakh’s remotest region. Lovely to read this! Only beautiful hearts see the beauty around.